The 5 Most Indestructible Dog Toys – ComeHereBoy! Do you have a dog that rips everything you give to her to shreds? Obviously, you don’t want to keep buying things only to find it’s been destroyed five minutes later. It can be hard to figure out while at the store which dog toys are indestructible, so we’ve made your job easy by listing the 5 most indestructible dog toys for you here! As a side note, before you leave your dog alone with these, make sure you supervise them at first to make sure that they really are indestructible to your dog. 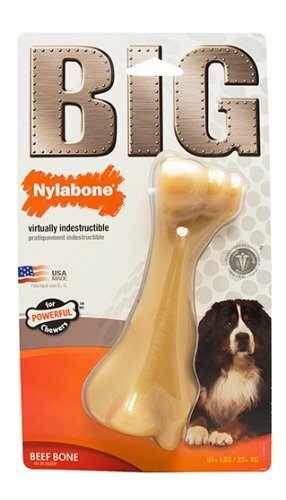 The Nylabone Big Chews have 4.5 stars on Amazon and the reviews are glowing. People who have despaired for years about finding indestructible dog toys for their heavy chewers have found their product here. 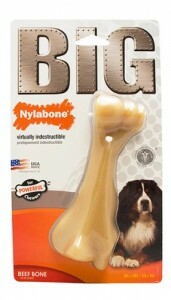 Many people say that their large dogs take up to a year to chew through these. What’s even better is that they don’t leave a mess or stink on your carpet like a real bone would, and the pieces would come off so small that you don’t need to worry about leaving your dog with it in their crate all day. Some people complain that their dogs aren’t interested in the Nylabone, and in that case I would recommend getting a different flavor and seeing if your dog is more interested in that. However, the vast majority of people have good luck with the chicken flavor. 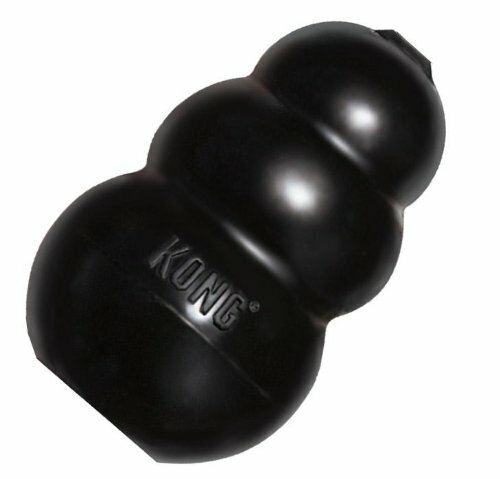 This is the mother of all KONG toys with really heavy rubber, especially meant for strong chewers. With 4.5 stars and nearly 2,000 reviews, it’s one of the best bets out there for an intense chewer that really needs indestructible dog toys to keep them busy. If you have a small dog with really strong jaws and focus, it is recommended by some reviewers that you go up a size from what the manufacturer recommends so you have the extra thickness. The nice thing about KONG toys is that you can fill them with broth (and freeze it), peanut butter, cheese, treats or whatever floats your dog’s boat and they can enjoy the toy for hours as they lick it and push it around. Definitely recommended as a classic among the indestructible dog toys. I know these aren’t technically toys, but as far as chews go, these really are indestructible. We love antlers at our house. My German Shepherd and Rhodesian Ridgeback will chew on these for hours and after months, they still look almost new. Antlers are natural and actually provide small amounts of nutrition for your dog, which is great. This brand only uses naturally shed antlers, so there is no need to worry about ethical issues either. We’ve had problems getting our dogs to chew Nylabones because of the lack of flavor, so I was pleasantly surprised when they took to antlers so quickly. The antlers are also so much less messy than bones, hooves, etc and you don’t have to worry about them breaking into pieces if you have the right size for your dog and you get rid of them if you notice they are starting to get thin. 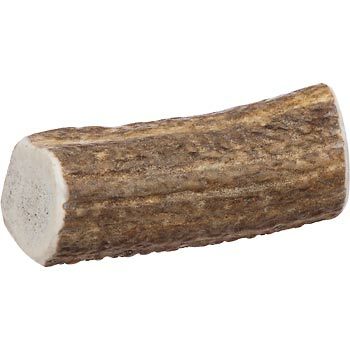 I really recommend these for heavy chewers and this brand gives you nice, thick, new antlers that will last a long time, so it’s totally worth it to get them. They sell them for a really good price as well. Their website is a bit old-school and you do need to call to order, but it is a good deal. Whatever you do, don’t go cheap and get split antlers if you have a heavy chewer. They break and wear way more easily! This is one of the only balls that seemed to have consistently good reviews as far as durability went. If your dog loves playing fetch with balls, but consistently destroys it afterward, this is the ball for you. 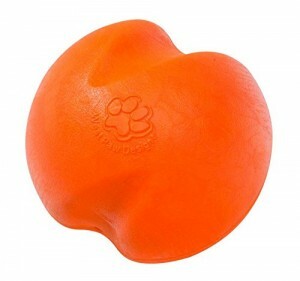 Reviewers reported that their dogs were unable to chew through this heavy rubber ball, that it floats if you want to play with it in water and that it is easy to find because of the bright colors. Another plus is that it has a one-time guarantee by West Paw. The only cons to the ball seem to be that it is heavy, since it is solid rubber, and that you need to be careful to get the right size. The medium size is the size of a tennis ball and the largest size is about a half inch larger, so keep that in mind. I’m going to warn you right now that this won’t hold up to a powerful chewer that gets to sit and gnaw on it. If you need a flying disc that won’t get punctured quickly and ruined, this is the one for you. It has great reviews from most people, but just make sure you take the flying disc away as soon as you can. People report various periods of time that it lasts, so there’s no guarantee it will be indestructible for very long. 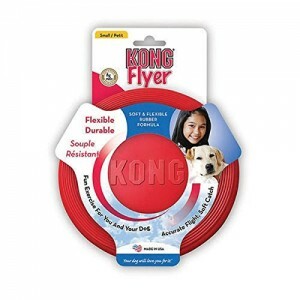 However, if you desperately need a flying disc for your chewy dog, buy this one.